To make PDF a real page flipping effect, you may be interested in FlipBook Creator Professional. 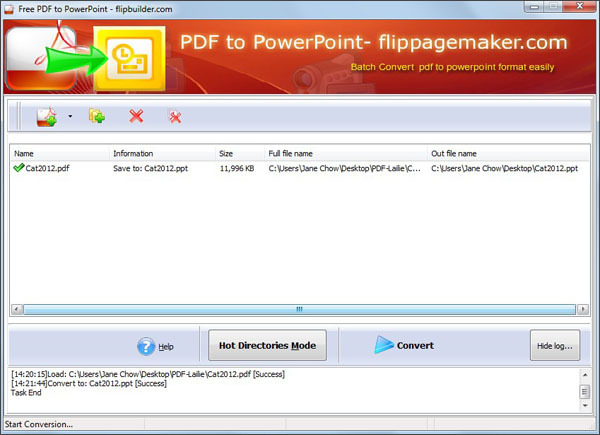 Flippagemaker PDF to PPT converter is a 100% free and efficient application to convert PDF files to fully editable PowerPoint files. If you are looking for a tool to convert un-editable PDF documents into act-like PowerPoint files, Flippagemaker PDF to PPT could be a good choice for you. With this freeware, you can update the documents with text, tables, objects, and master layouts with ease, you can batch convert your multiple PDF files into PPT format, and you can also get high quality PowerPoint slides rapidly with preserving the original PDF look and feel. Furthermore, the program also provides Hot Directory Mode and Command Line Mode for you to use. We convert PDF to PPT mainly because we want to show the PDF as sliding presentations. Presentation is widely used to report, meeting and speech. How to convert a PDF to PowerPoint with Flippagemaker PDF to PPT? In Hot Directories Mode -> Set directories -> Start -> Copy and paste a PDF file into Input Directory. Flippagemaker PDF to PPT is industry leading PDF to PowerPoint software that is the most accurate solution available today. We have taken users’ requirements into seriously consideration. The exporting presentations will retain the original contents without any loss. 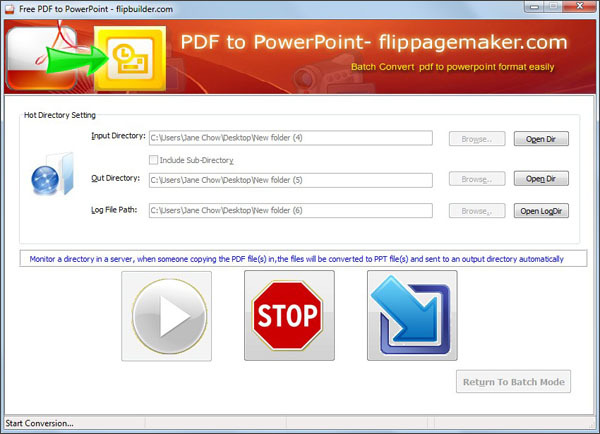 Flippagemaker PDF to PPT software is perfectly free for all users. The easy and flexible program will help you to convert PDF to PPT format in batches with good output quality. How to take un-editable content out of Portable PDF documents when you do not have any PDF editor? Flippagemaker PDF to PPT Freeware helps you generate editable PPT slides with your PDF information within a short time. 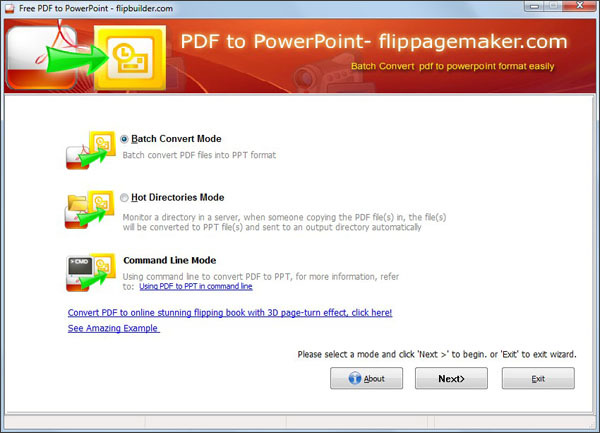 Once install Flippagemaker PDF to PPT Freeware, you are enable to choose proper conversion way at your convenience: Batch Convert Mode, Watch Directory Mode and Command Line Mode. All products are free to upgrade, once you purchased the software, you can use it forever. We will improve its functions continually. And we keep the right to release it as paid software for later versions. But you do not need pay one cent for upgrading.